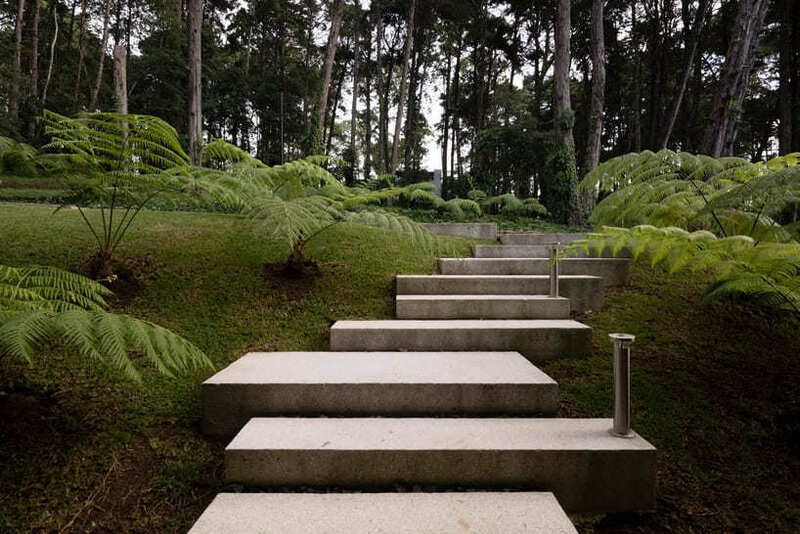 The concrete fixation begins with the home’s entrance, which is reached by descending a series of concrete steps, irregularly placed so as to create a pleasing resonance with the rough topography. 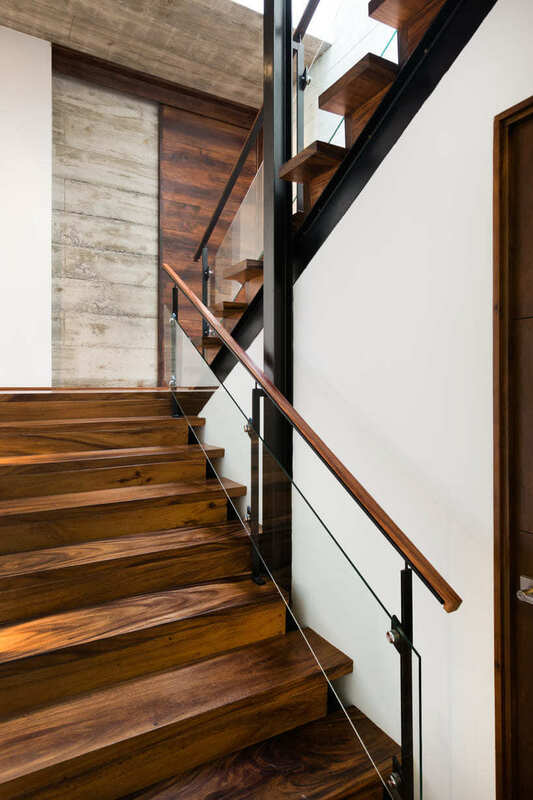 At the head of these stairs, the façade cuts a striking shape. 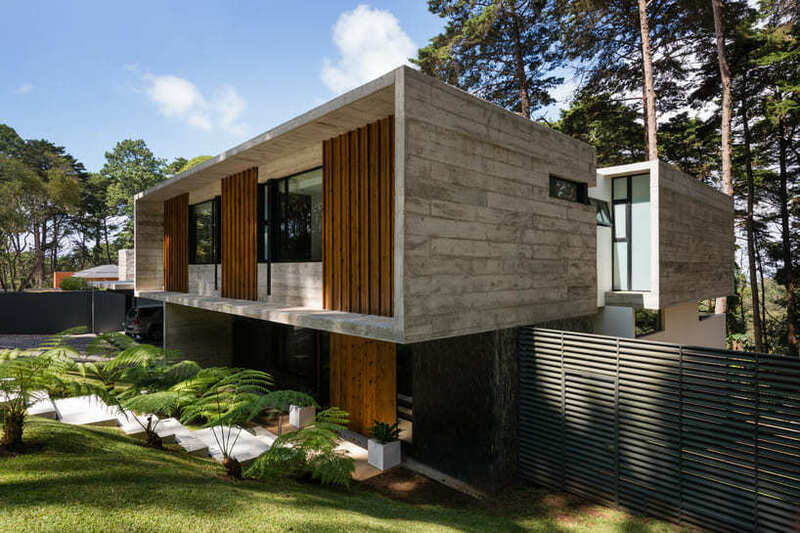 It is dominated by the structure of the upper floor: defined by a clean white concrete rectangle which has been subtly emphasised through having the roof, floor and two side walls extend out from the main volume by roughly a metre. 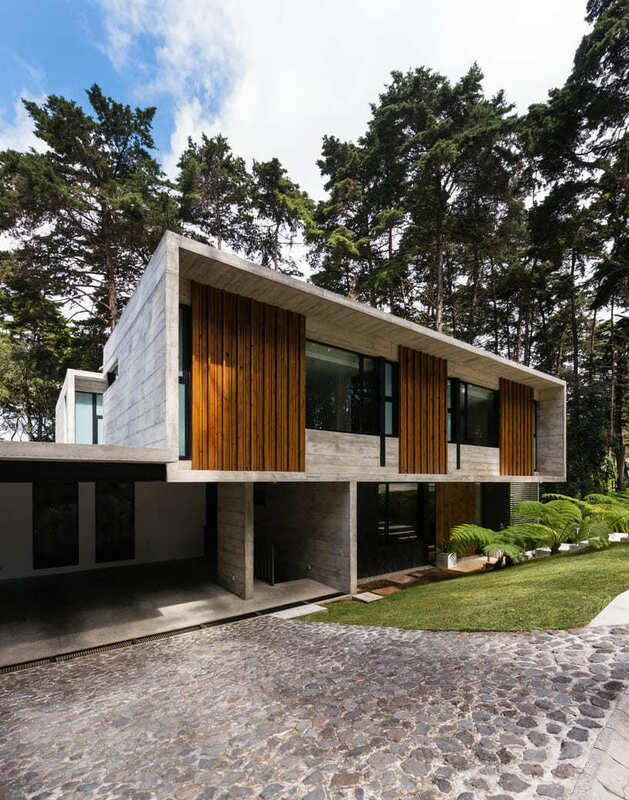 Looking at the website of the architects, Paz Arquitectura, the concrete rectangle is a clearly identifiable motif throughout their oeuvre. It is most evident in their residential properties, where it can be seen in varying degrees of abstraction. 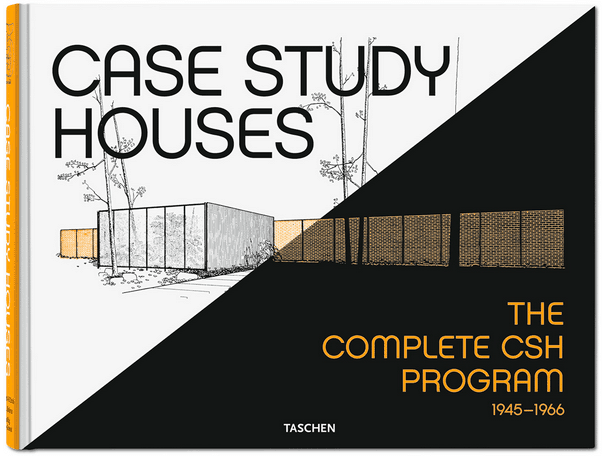 In the case of the LP1 project, the rectangle frames a symmetrical arrangement of windows and wood panels. 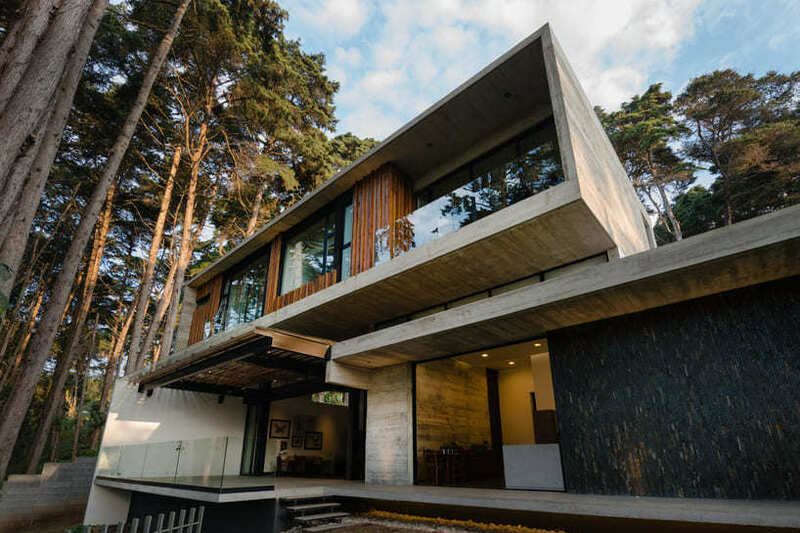 The combination of the white concrete, the black window frames and the rich brown of the polished pine wood panels is really impactful when set against the wild surroundings, with the contrast bringing both structure and nature into stark relief. 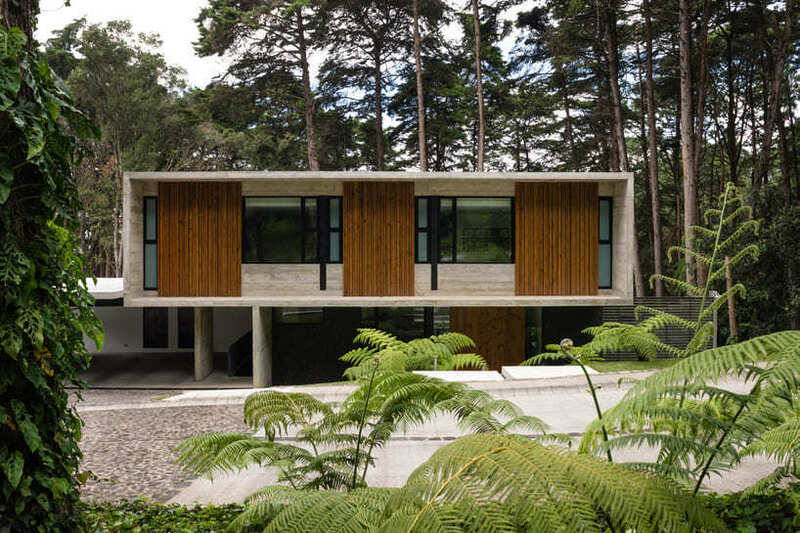 The home’s bedrooms are situated in the part of the house which the rectangle is framing. Featuring floor-to-ceiling windows and located at the highest point of the property (which is itself situated on top of a steep slope), this space achieves a really intimate interaction with the cypress and pine woods which surround the house. Looked at from the entrance, the lower floor seems quite obscured and generally closed. And so, you might think this is an unusual place to have the more social living space located. However, this lower floor still offers an impressive vista due to the steep slope and the wide expanse of windows. 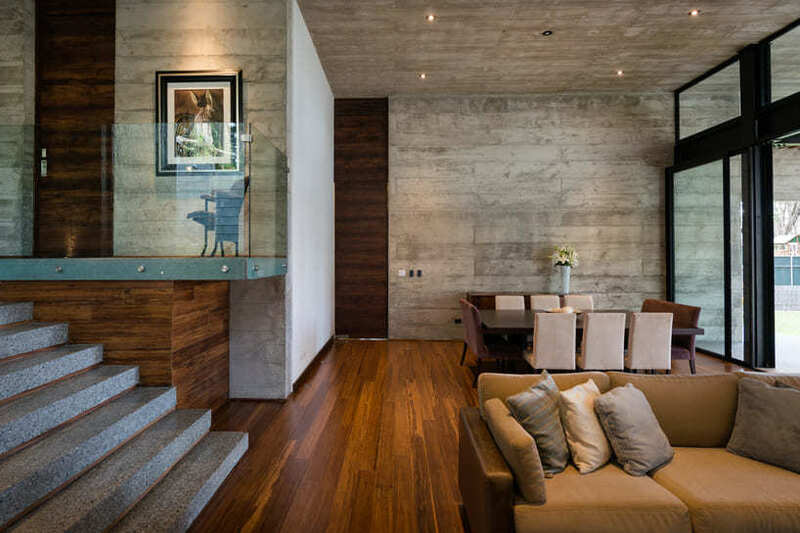 Just as with the exterior, exposed concrete again takes pride of place in the overall interior aesthetic. Notwithstanding the fact that this creates a really pleasing consistency to the overall composition of the contemporary style home, it also has the advantageous effect of bringing the beautiful artworks into sharp relief, many of which were produced by the owner, a painter by trade.